Will Your School be joining in on Outdoor Classroom Day? 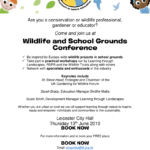 On the 18th May, Outdoor Classroom Day will be taking place across the globe and we want to know what your school will be doing to get involved with this day. Learning and playing outdoors creates lasting memories, helps build a greater awareness of the environment, provides opportunities to think independently, and helps children to feel challenged and excited by learning. Not only this, but outdoor learning also benefits children by building on their social skills and enhancing their problem solving and team working skills. Outdoor Classroom Day acknowledges the several benefits that outdoor learning has for children of all ages and aims to highlight these to schools across the globe, encouraging them to get their students learning outside of the classroom. Lessons learnt outdoors often stay with us for life, as being outdoor helps children to focus, boosts their creativity and imagination and helps to keep them engaged, due to the simple fact that outdoor learning can be much more fun than being stuck inside a classroom. You know the benefits that outdoor play and learning can achieve, so will your school be getting involved with Outdoor Classroom Day? 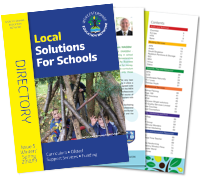 You can easily get involved with this day by signing up your school on the Outdoor Classroom Day website, checking out the excellent resources available on the website and by taking your class outdoors on the day. You can also get inspired by seeing how schools across the world are getting outdoors to learn and play, on Outdoor Classroom Day and all year round, by simply searching the hashtag, #OutdoorClassroomDay on Twitter, Facebook and Instagram! If your school is looking for further inspiration for Outdoor Classroom Day, we have asked some of our members to share their thoughts with us, to help your school get your students learning outside of the classroom! “At this time of the year, students will be able to easily observe plants at all stages of life cycle, from the germination of new seeds through to seed distribution, which in the case of an annual plant will be the finish. Early pollinator insects are also abundant to help describe the benefit of a diverse ecosystem both for plants and wildlife. 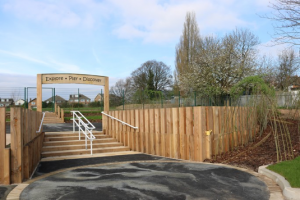 HFN are experienced in installing accessible garden areas for student’s recreation, quiet time and for practical school work including scheme design and plant management. This picture is of a multi-level garden area installation we completed at Greenholm Primary School, Great Barr earlier this year. “This Thursday May 18th is International Outdoor Classroom day. A light relief after Key Stage 2 SATs! Take this time to get in your school garden (if you have one), hold an art lesson in the playground, go on a natural treasures hunt or get out your copy of 101 Playground Games and introduce new games to your children and play! 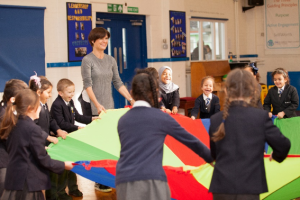 I’m going to be spending the day teaching playground games to children in a Birmingham school. How will your school be spending your day? Why not give our GOW (Game of the Week) a go? This week’s game is ‘The Hokey Cokey’ and is one of my favourites! I remember playing this in Primary School and I can even remember the name of the teacher who taught it to us, Mr Dennis. I loved it that much! Make sure you introduce it to your children this week, as it’s a firm favourite when I’m running playground games training. You can download our Game of the Week here – The Hokey Cokey. 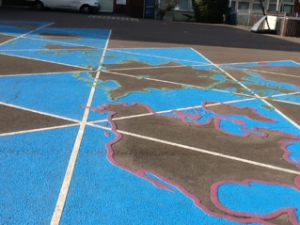 An artist’s impression of a two dimensional globe, so that children can fill in the countries and seas, with blue chalk for water, actual sand for hot countries and their own symbols that they relate to other parts of the world. We know that, although a playground can be a fun place for a child, it can also be daunting and lonely, if they have no one to play with. 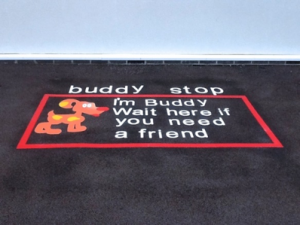 We have seen a school within the Worcestershire area that has ‘Buddy Stop’ line markings within their playground, where a child can go to get a friend to play with. 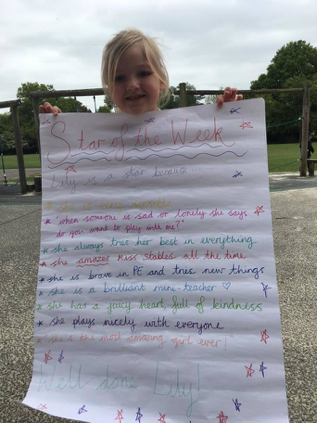 The same school also creates a poster for ‘Star of the Week’; each week, a different child is chosen and a poster is created listing all of the things that make them a star. 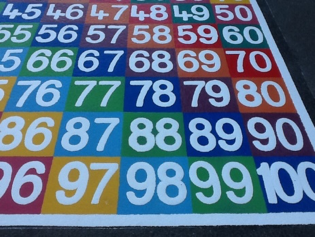 If you would like to talk to Parallel Lines about your playground ideas, they will gladly help you bring your concepts to life. “Special Offer from Landscapes Naturally! Any time of year can be ‘outdoor classroom day’! But this is a great way to focus attention on the benefits of learning outside.